I have recently been contacted by a biologist from Finland who wants to remain anonymous. 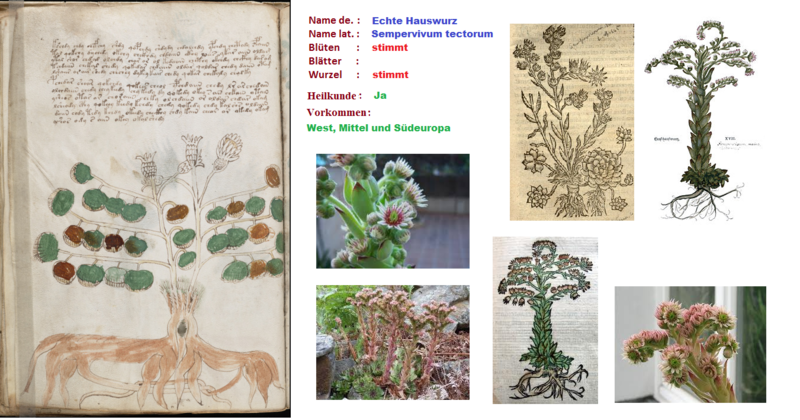 He has put a lot of work into looking at the Voynich plants, and has come up with some very interesting ideas and detailed discussion. He has agreed that I can post them here. Many of them are informal and initial opinions, but I feel they are still extremely useful contributions. I’m most grateful to him for his extensive and considered analysis. Note that he reached his decisions independently and on the basis of biology, not of the language side. You can use the search box to find particular pages or suggestions quickly. and upper side. Leaf arrangment not clear, but not whorled. - Which parts are correct, which are not? - Which part is significant to the author (pharmacy effects)? Atropa belladonna or Scopolia carniolica. All are pharmacy plants with rhizomes. have at least some imagined features for any plant, however. E.g. Hydrocharis has similar leaves but difterent roots. somewhat filled-in by imagination. Nymphaea has pharmacy uses. BOTTOM and ROOT, since this is a water plant anyway. Of course "water"
spores, as might the brown colours. First bid: Linum usitatissimum or Linum catharticum. FIBER/THREAD/ROPE/CLOTH (products of stem fibers). My first suggestion is Polemonium sp. splits in sectors ans also the calyx may leave star-shaped remains. would not be well drawn. possible of course e.g. in a withering plant or as an artistic decoration. the image has some resemblance to that of Paris. Paris is poisonous and has been used as a pharmacy plant. leaves would fit better in e.g. Potentilla argentea. A big genus. Another candidate genus with smallish to middle-sized plants is Geranium. [re. Ricinus communis] It is very natural to conceive image 6v as a representation of a rather stout plant with palmate leaves (i.e. lobes radiating from a single center) and with big, round, spiky fruits. Please note the deceptive zooming problem, however: Compare this with the leaves of 16r which you (perhaps correctly) relate with a juniper (in this case, the flowers of 16 r would be male!). 16 r would then be a close-up, width of page being only about 5 cm, while the page of 6v, if Ricinus, would represent e.g. 1-2 metres in nature. I looked if there is any difference in leaves of 16 r and 6v. With good will, you could see in the supposed Ricinus the central veins of leaf lobes outlined in 6v, and the "needles" of 16r may be a bit more overlapping, more suggestive of individual needles. But a really different meaning remains unsure. - Arctium (the spiky things being a modified inflorescense), but in Arctium the leaves are large roundish, not palmate. All the previous would fit into a stout plant about as large as ricinus. - If we assume that the artist has zoomed very much, there are several plants which have very small (e.g. 3-5 mm wide) spiky fruits which may attach to furs of animals, e.g. Galium (paired fruits, narrow leaves radiating directly from stem), and several Apiaceae or Boraginaceae, but to me these seem a bit far-fetched. Members of Dipsacus also have structures like Arctium. But with these comments, and perhaps overlooking some mediterranean plants, Ricinus really IS a very promising and natural candidate for 6v, and we do not need any imaginary additions for that assumption. Even the blue colour in fruits might refer to purple colours which may occur in any part of some Ricinus varieties. The drawing style might hint that the fruit is the emphasized part of the plant, and these (or the seeds inside) might have been stored/sold as a potent pharmacy product. I forgot at least Aesculus hippocastaneum. That should also be considered as a candidate. Palmate leaves (although 6v is more ricinus-like) and spiky fruits. But I would rank Ricinus higher, since the image looks more like a Ricinus. alternatives. It would be important to know the zooming level aimed. grafted by the artist to the tip. Other members of daisy family which are missing ray flowers? E.g. badly drawn and represent e.g. rhizome tip leaves. the flowers would be badly drawn. of(pharmaceutical?) intrest to the artist would seem to be the roots. mentioned above. Maybe the painter has something wrong. species nave often various shades of red or purple. have got material from alpine environments. There may be more southern Mediterranean plants which I no not know about. wrong or exaggerated, which is more right. leaves convey the same information of a branching bush. The "flower"
far-fetched. (long leaves, paler purple flowers in spikes, not so dense). artist has "grafted" directly with the root system. of Urtica, since its flower parts come in groups of four. damascena or Nigella arvensis 16v shows another mystery plant with a large, star-like, "hypnotizing"
as well as thread-like upper leaves. case similar words could occur in both Nigella pictures. Smilax excelsa [Compare with 99r,, possibly ] 17v represents the more slender, close relative Rumex acetosella. The difference between these plants' leaf base lobes (arrow-like or "spear-like" with protruding side tips) is still a valid diagnostic feature. This could act as a poorer substitute for 96v with about same effects. ........Smilax species have been used both as food plants and especially on other continents for medicine, too." 18v Pulsatilla vernalis, or Malvaceae?? 18v first choice: Pulsatilla vernalis or other Pulsatilla species? have been used in pharmacy. Distribution e.g. Alps and northwards. several unrelated groups including Polemonium, Campanula and Gentiana. in figure's fruits and for longitudinal structures vaguely illustrated. have invented from other flowers he has seen. Artist would really have seen it, possibly as a dried specimen. as dots), there are very few characters to solve the species. flowers and opposite arrangement of leaves. roadside or similar hard, dryish site. looked at the flowers more closely. this niche and may have similar forms and rudimentary structures. am not so familiar with. special feeling in his fingers when touching the leaves. and seen, and the flowers may be drawn based on a foggy memory. have blue flowers, as well, albeit not fully similar to the painting. spikes. Drier places than previous. match in leaves, but these are annuals, the drug rhizome totally missing! plant in front of his eyes when painting. notably Plantago spp. used e.g. for wound healing and Arnica montana. marks in leaves of Phragmites. Not very promising as to habitus. Arnica, then a number of others, but the image is not solved. those days, in a way or another! 30v Mercurialis perennis First bid for 30v: Mercurialis perennis. Note this plant has a horizontal rhizome in contrast to the related M.
with some old pharmacy uses. originate from Asia Minor but cultivated elsewhere. Achillea millefolia or Chamomilla recutita. 32r Prunella vulgaris First bid on 32r: Prunella vulgaris. Has been an esteemed healing plant. have somewhat similar flowering spikes. such as wakenness/sleep, drug use/food use, or pleasant effects/poisoning. mainly had access to the capsules, instead of the whole plant. directly imagine inflated basal parts of flowers. 34v Arctium sp, especially Arctium lappa. A starting guess for 34v: Arctium sp, especially Arctium lappa. that the plant has flowerheads and has rounded leaves. habitus would be quite clumsily drawn. root product is Radix bardanae. imagination, only, the the logics above cannot be relied on. 34r Sanicula or Astrantia? A starting guess for 34r: Sanicula or Astrantia? At least Sanicula has been used in pharmacy, especially for healing wounds. Sedum telephium (sensu lato)?? Valeriana?? are allowed). Both have had pharmacy uses. poisonous ones such as Conium and Aethusa. 41r Ferula assafoetida? Gnaphalium sp.? Plantago afra (Plantago psyllium) First bids for 41r: depends on zooming. although this should have yellowish flowers. Plantago afra (Plantago psyllium) is among the promising candidates, too. It produces seeds which produce a lot of mucus when moistened. Has been used in pharmacy. Arum (secondarily, Calla or Sagittaria). Folio 42r seems to illustrate two species of plants. are suggested to have similar pharmaceutical properties. Arum (secondarily, Calla or Sagittaria). I suggest that the smaller, three-lobed one would be Menyanthes. share common biotopes in some areas, e.g. moist and/or shadowed places. assumed these, or the pictures represent young (cultured?) seedlings. Trifolium. But that is another story. used as a healing plant. 43v, right: Bupleurum rotundifolium (or a related species such as B.
being fused round the stem. that these plants are related. Some Bupleurum species have been used as pharmacy plants in Asia, at least. (actally a compound of many) would be simplified in the image. which stand upright in the bud stage. rhizome). This would be a pharmacy plant. Jovibarba is a very similar genus. variety of plants. Eg. small shoots of Sedum. They all grow on dry, sunny cliffs, mountainsides etc. 47v Pulmonaria First guess for 47v: Pulmonaria? Second choice: Other Boraginaceae (e.g. Anchusa)?? 50v Soldanella First guess for 50v: Soldanella? white ones, or is the image a fusion (chimaira) of two species? compact inflorescences (e.g of Daisy Family or Carrot Family)? the image been painted of an aged plant or only a top of a plant? leaflets and petals of different lengths such as Coriandrum sativum. Also in this case, the blue flower would be a contaminant. 65r Sanicula or Astrantia? 65r is oddly drawn, but Sanicula or Astrantia might be possible starts. cretica ssp. dioica (female plant). for e.g. alimentary channel disorders. communicate the climbing character of the plant. Ivy is a pharmacy plant, used for at least respiratory disorders. flowers would be wrongly painted, however. 99r Rumex acetosa? Dioscorea communis / Tamus communis? 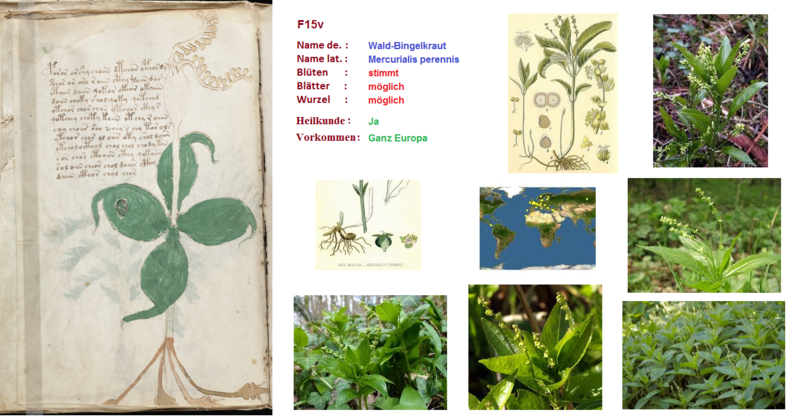 Finding matches between possible recipes and illustrations, you might start from the last entry of Folio 99r, illustrating only one plant, both the shoot and root, comprising the whole drug. I propose as the first assumption that the plant is same as 96v, and represents Rumex acetosa. of this species have been used against scurvy (=scorbutus, later understood to be caused by C-vitamin deficiency). clumsy style, there are also other plants that are not excluded, as yet. during transport, with a drooping top. basal flaps of the leaves, would suggest these slender Rumex species (R.
leaves are generally more heart-shaped. But possible, yes. or labeled (idealised) cylindric drug vessels (such as "Witche's Blood"
or "Druid's Super Drops") which contain the plant parts shown. which are extracted or distilled into drugs when cooked etc. with the usage of these plants. illustrations" and these possible recipe details of same plants. Folio 101v, middle page, second entry from above. Armoracia rusticana Also here it seems that a single plant comprises the whole drug. The product looks quite much like horseradish (Armoracia rusticana). hypothesis, although not diagnostic data. large images, but it may be known by name, already. supposed Rumex acetosa. Naturally acts as spice, too. In Wiki there are some older names, Sinapis Persica or alike. entry 101v, 3rd page, last entry in the bottom of page. addition, also the lantern structure was illustrated! Good match. However, word matches would be good to confirm this. I think that 65 r could be Tanacetum vulgare, also called in some manuscripts Artemisia media (e.g. Egerton747). This is one of the lichens, but it was also applied in medicine. Please have a look at Folio 6v, can you read the first word? I attached it as a .jpg. In Latin Letters it looks like “MoaNaj2aR” doesn’t it? Ok, the 4th cipher in the VMS looks like a very bad drawn 2 or a laying “N”, so we should take the “N”, which makes much more sense. Now, “MoaNaj2aR” does not mean any thing, but think “around” the corner. To get back to “MoaNaj2aR”, please read it from the right to the left. Do you recognise something? You’ll read it as follow: ” RaCjaNaom”. Now turn the letter “a”, 180 degrees. You’ll get an “e”, so we get the letters ” ReCjeNeom” –> “Recineom” adapted to classical Latin ” Ricineum” or “Ricinae” which means “castor-oil-plant” in English or in German “Ricinus-Pflanze/-Baum” or “Wunderbaum” which means literally translated “wonder-tree”, funny, isn’t it? Think about the word “wonder”, and the above mentioned. This is not the hole solution, but one of it’s meanings. Also, think about the meaning of “wonder” and the “virulence” of the castor-oil-plant. Also, think about Ceanajbas –> Cannabis(Latin) –> “cannabis” (Engl.) –> Kannabis (Ger.) or also “heamphas” –> “hamfus” (Lat.) –> “hemp” (Engl.) –> “Hanf”(Ger.). What about Camphar? “Coamphar” –> “Caphuar” (Lat.) –> “Camphor” (Engl.) –> Campher/Kampfer (Ger. ), can you see the parallels? Tag: “Barbianaorum” read from the left to the right. “Barbianaorum” –> “Barbiturat”(Lat.) –> “barbiturate” (Engl.) –> Barbiturat (Ger.). All three can be cathegorized as a barbiturate. But I think that the castor-oil-plant should only be used in really tiny amounts, because of its painful deadliness(bad for the liver!). I mean really only in homeopatic doses, like “strophantus” <– ^^, which is also a high toxic plant. Please think about my thesis. Have you ever thought about a genious combination, which combines related subjects, with each other, like I explained above? “Maoriailios”-> “Maori Illos”–> “islands of Hawaii” ==> “castor-oil-plant” (it is not from India, it was exported to India, the Wikipedia article and many books are wrong, with their false pretences, about its origines. It actually comes from the island of “Rikitea”. Please, be respectful about my “discovery” and please, don’t for get the source citation, because it is a part of the book, on which I’m write at the moment. This is still not the hole solution, and that only for this word! But I gave you many useful hinds, to understand the VMS, in a different way, isn’t it? 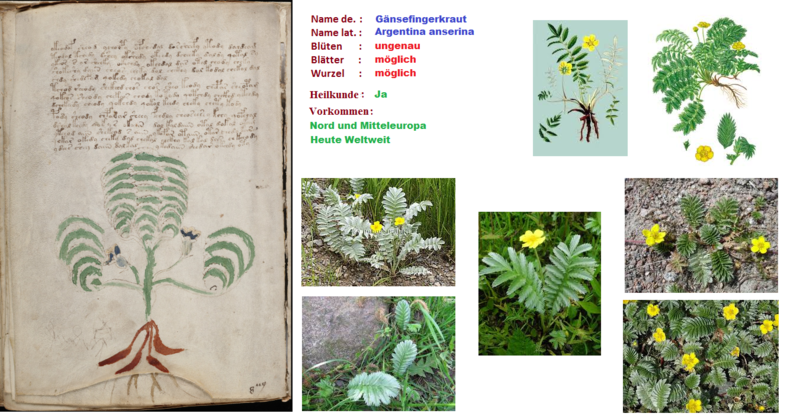 my reference is “Strassburgers Lehrbuch der Botanik”, in my oppinion, one of the best books about botany. Nice work, but there is not one Cannabis in VM. First of all, thank you very much for your answer! I think you are right, about the Cannabis. After carefully revising the folio 6v I agree with your remark. So please ignore my suggestions about Cannabis! But I’m sure, that the picture in VM 6v, is a castor-oil-plant, the shape of the leaves, and the nuts are very similar. In my examples, I wanted to show, that a ciphered word may have more, than one meaning. That is because I recognised, that there are different “layers” of texts in other sections. I also think, that it is not about barbiturates, because the castor-oil-plant seems to be too poisonous for such applications. 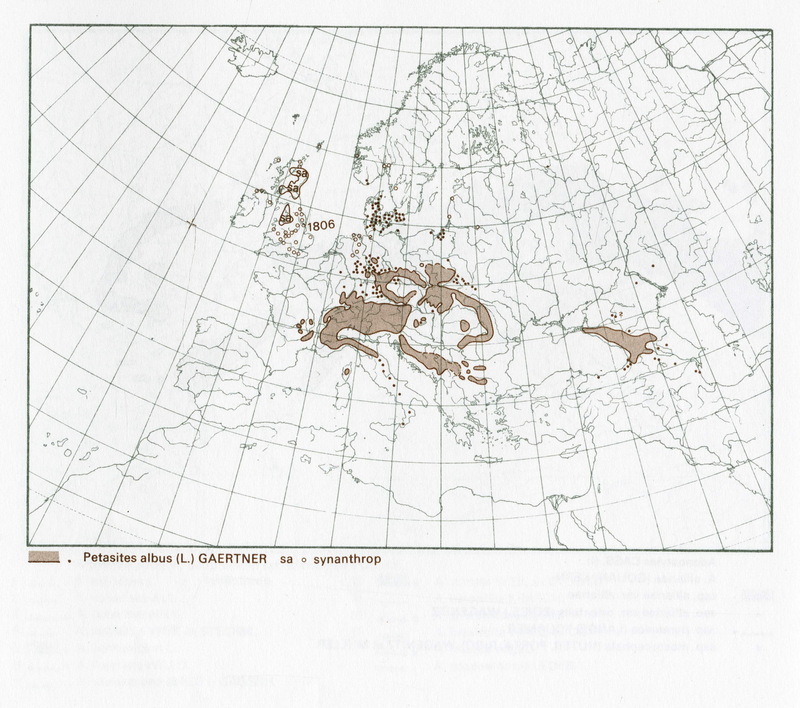 At the moment I have transcripted some phrases, of some pages, which make absolute sense in relation, but in the botany parts of the VM, I’m not as far, in transcription, as in the geological map sections. I think that the second layer of the mentioned word, is also about the castor-oil-plant, and it’s toxicity. –> “Mortem in 2 diem” (Lat. )==> “Die in two days”, what means that you will die within two days, if you eat castor-oil-plant nuts. Please have a look at the historical use of the castor-oil-plant nuts/seeds. The nuts/seeds were used as a “trial of ordeal” in some cultures, and if the accused survived these two days of massiv pain, he was released. I think that would make much more sense, in context of folio 6v. What do you think about my suggestion? I also think that this is to ricin, and 99% secure. The next possible is Echinops since but agree not the leaves. This is interesting, it was formerly used as oxytocic (parturifacient). See the page all about this folio and Ricin. Thanks for your answer Peter! I agree with your suggestion about the use as a oxytocic. My grandmother was a nurse, (before and while WWII), and she worked also as a delivery nurse, so she comfirmed, that it was used sometime ago as a parturifacient. Interestingly, the majority of plants have something to do with the problems of women. Whether that has something to do good to the many women in the book?
? Do you speak in German ? Yes, I normally speak German, but I’m from a bilingual family, so my mom’s family speaks French and my father’s family speaks German. But actually I’m not German, I’m Swiss. Interessant, ich komme auch aus der Schweiz, nähe Winterthur. Falls Du mal reinschauen willst, ist in deutsch. Interessant, ich werde auf jeden Fall mal rein schauen. Two years later, I realize your comment is pretty interesting. I don’t believe the plant in the drawing is P. oleracea. The distinctive element is brownish dots along the stems. The habit is just like the actual plant, which I have a lot of in my yard. This is a screenshot that includes both plants, and the drawing. I know them both well. I also embedded it at the end of this comment. If it is a North American plant, that tells us something, or hints at a few things: the author had been to North America or corresponded with someone there, the plant was present in limited areas in Europe, arriving as seeds in the clothing or effects of travelers, or the book was made in North America. I think I’d wager my house on its being Euphorbia supine. I would sooner say it’s neither one (E. supine or P. oleracea) than go with P. oleracea. and others on that opening also resemble the Voynich plants – a bit more than most, anyway. 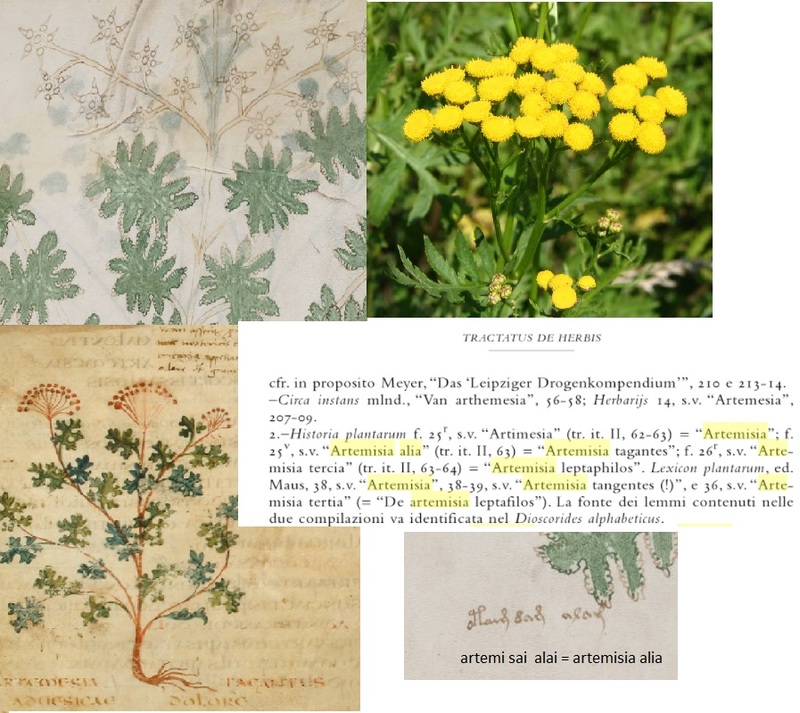 I’m not sure what the spots signify in that case, but in the Voynich plant-drawings they seem to indicate that the leaf produces an oil – although definitions of an ‘oil’ when the drawings were first enunciated might have had a wider range. Folio 2v is manifestly no nymphaea: one can hardly miss the inclusion, by the draughtsman, of protruding and rather hibiscus-like pistil and stamens. For the non-biologists, here’s what I mean. The illustration shows an hibiscus, but that is no indication that the plant on f.2v is an hibiscus, too. Its kidney shaped leaves suggest a succulent, I think. The habit of reading a Voynich image only for such bits as can be made to conform to a pre-existing “theory-narrative” for the manuscript, and of ignoring every other element in a drawing, or excusing its omission by supposing some incapacity in the draughtsman is very common, and has been around since the middle of the twentieth century. In the meantime, the art and science of analysing imagery has advanced somewhat. Perhaps its time that Voynich studies caught up? Hello Steven. I have a masters in botany. I have watched your youtube film and I would like to suggest f3v as aconitum, monks hood. such interesting work. Good luck! I think I’ve found f9r. Have these photographed in a garden. Unfortunately, I could tell the name until today nobody. Maybe yes someone knows of you the name. New Photos until next year possible. This certainly looks very similar. The plant was previously identified as “aloe” on this site by someone else, but that person didn’t explain why or show pictures illustrating why, and I’ve never known what made him/her think that. The first word matches aloe’s Arabic name in my phonetic system (“alʔloät/ãkoatap), and I haven’t found a phonetic match yet for this identification instead, but I will look some more. It is not just a name of a plant to find if you do not know in what area you should look for. Whether the colours are original or were added later remains an open question, so one cannot be sure that they should be used in the tentative identification. It’s worth pointing out that this page also seems to have ‘faded yellow’ in the flowers. 2-3 paragraphs below the illustration, and in particular footnote 6. Also I think the color could be applied later, perhaps not at all. But also assume, if he has recognized the plant that he also has the right colors used. I mainly take into account the forms of flower, leaves and roots. At the same time they must occur in a specific region. They should be demonstrably also been used medically or mytisch. Only these factors give the plant a kind Indentification and viewed me as possible. Therefore, the fringe of the Alps is my first choice. Climatically all there: cold, hot, wet, dry, sunny, shady, high and deep areas and on small area. The pics in situ show Geranium pratense (as Peter wrote). But the German name is Wiesen-Storchschnabel (pratense = in meadows, in Wiesen). Geranium sylvaticum, Wald-Storchschnabel (sylvaticum = in forests, im Wald) has darker blue-lilac blossoms and not so deeply pinnatifid leaves. The drawing in VM looks more like sylvaticum. But maybe in medieval times these two rather similar species were not distinguished. The plant in page f41v looks a lot like a wild carrot plant which is a root veggie, matching the one depicted in the illustration. Coriander is not a root veggie. In addition to that, in the video you have posted in YouTube you pronounce its title as “kourata” which is pretty close to the latin carota. Yes, I think you are right, good job! I my opinion, the imagery does not suggest an intention to produce photographic likenesses, or even ‘botanical drawings’ in the Dioscoridan style or as modern western ideas think pictures of plants should be made. It is important to remember that these are not “drawn photographs” but pictures, made for the purposes of the people who made them. To assume an intent at scientific realism is to mistake them, and their makers’ intention. The only parts of each plant which closely copy a plant-group’s defining plant are (i) the habit (ii) whether tree, shrub or vine – this is indicate by thickness of stem, and a vine by slight undulation. (iii) leaf formation (iiii) petioles. All other parts of the drawing are formed pretty much as mnemonic elements, and are not to be taken literally: they refer to the common commercial value of the plants in a given group (i.e. a given folio). Other cues are offered by the design of the roots, by whether or not there is what I’ve termed a circumscription line (others have supposed this to refer to grafting) – which tells whether or not the plant is cultivated. No line means it grows wild. A broad-looking surface from which plants shoot up signifies rapid regeneration. It is a mistake to approach these wholly non-European images with a presumption that they can be made to fit into the western herbal corpus. There is no reason, except entrenched presumption, to justify that habit. The imagery itself does not conform to that expectation and the style of drawing and placement of the image on the page all re-inforce the message that these pictures were *not* designed in Europe nor according to the European traditions. I have also – for the past five or six years – been urging people to consider the Nestorian Book of Medicines. Perhaps it will appeal more if I point out that Marsilio Ficino actually quotes some of those recipes, notably the one for Rhubarb pills. I do agree – and hope I am not failing to do anyone else justice but I think I was first to suggest – that when you see the ‘harlequin’ effect, it refers to plants having noticeably different colour on one side of the leaf than the other. The mangroves are the most obvious example of this in the manuscript, but a similar effect is produced, as the writer says, by having leaves hairier on one side than the other. 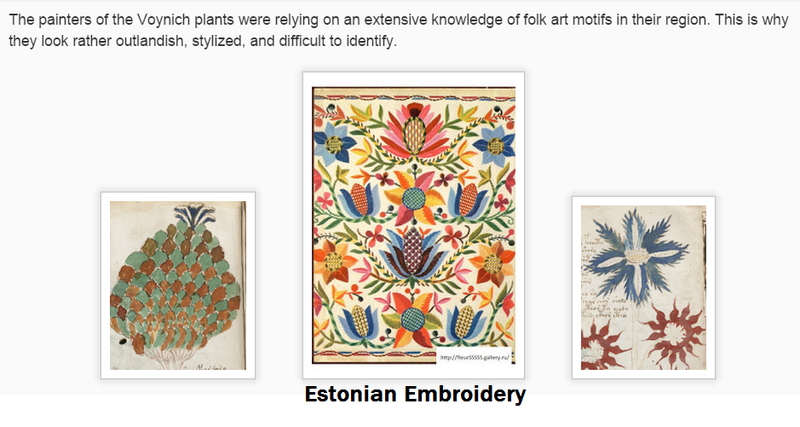 The painters of the Voynich plants were relying on an extensive knowledge of folk art motifs in their region. This is why the plants look rather outlandish, stylized, and difficult to identify. 11v could be Annona Reticulata or custard apple. Used for a whole host of remedies and for making blue and black dye. Please understand that I’m very happy to have the results of my research taken up – obviously, it validates my conclusions and makes the effort worthwhile. The reason that I keep insisting that those who take the results and re-use them also acknowledge where they first read the information is that I am in the process of writing up my work for publication, and I do not wish to be put in a position of having to prove that I have not ‘plagiarised’ my own work and its original findings. I shall be publishing all the work which shows when, and how I arrived at my opinions about folio 86v, and first explained it as a map of the makers’ world – without reference to M. Ponzi. I shall also be claiming the ‘Centauria moschata’ identification as original, unless I can find clear evidence of precedence – about which I have always been eager to hear, and properly acknowledge whether or not I knew of it in advance. What is arabic about the VM author’s name of this plant? Nearly perfect match with Latin ‘centaurea’! Only don’t ask me why he (probably) heard a long ‘u’ in the word – I don’t know. 3). the final vowel is ‘i’ => ‘kentaūri’. P.S. The correct parsing of any known word is the main prerequisite for successful decipherment of the script. låsan – From Old Norse láss, from Proto-Germanic *lamsaz. Couldn’t that word be “kardamom”? ;-) It looks like “K”, “aj”, 8= (“R”, “d”), “a”, “m”, “o”, “m”. The squiggle in the “o” induces to go back in reading. What do you think about my suggestion? I’ve seen this word near a plant, which looks very similar to cardamom. Have a look at the blue blossoms and the form of the plant. Yes, Ellie, I’m glad you agree with my reading for the flower within the figure – as you’ll remember, I first posted it in my blog ‘Findings’ and you were kind enough to comment then that, as a newcomer, you’d never have thought of it. My id was actually Centaurea moschata, used by the Persians to scent papers – and I expect to help preserve them. But this will be old news to you, having read it there three years ago. It is so nice to have others concur with one’s identifications, I agree. f44r could this be Argan? The second word reads ARO(G?)N. f49v is white turmeric, also known as Kachora, and the first word on the page is Kachor? I’m not gonna pretend I know much about this, actually I only just found out about the VM in the youtube video a few days ago, which is what got me interested in the first place. Anyway, I was going through the VM and decided to try the same sort of translation technique as seen in the video, just for the fun of it, on the first word in page 3r. I’m not sure if its since been translated or if you guys already know about it but I am pretty certain I have found the correct translation. I assumed the first letter was a k even though it had an extra loop on the top left of the letter that the k does not possess. since i was just stuffing around I assumed it was a variation of K and moved on. The rest of the letters had already been translated in the video I watched so after putting it all together i got “Kuooas” and after a bit of google searching I found a plant called the “Koova” plant http://jamesjomy.blogspot.in/2011/06/flower-of-koova-curcuma-angustifolia.html. It also looks very similar to the drawing in my opinion. f21r: Polygonum aviculare as ided by Ellie Velinska. However, no good characters in the drawing (=> B-list). I have to say foremost that I am currently working on plants of alpine nevironments, so my view on the drawings may be highly biased. I did, however, came up independently with the identification of f6r as belonging to the genus Petasites (as has been made by the Finish but is not in the list on this page). I sent the picture as .jpg to a colleague of mine, she was working on systematics and relationships within this genus. I sent the picture and just this question: “Which species is this?” (Agreed she may as well be highly biased.) She immediately replied Petasites albus. I have to mention that she studied several specimen of the genus for her dissertation and I will ask her for a list of characters that she thinks to see in the drawing. Thanks again. I will make a page for it. Couldn’t resist the VM today. f56r from my professional point of view (botanist) is most definitely from the genus Drosera. Astonishingly in contrast to some other drawings everything seems to be in proportion (leaf size, size of the glandular hairs, flower size). The artist even went so far to depict the basal parts of the old dead leaves at the stem base. The curly flowering stem is a natural depiction as is the order of flower opening from base to top. I would not go so far to precisely determine the species, my suggestion would be D. rotundifolia (as was suggested elsewhere), there are, however, more than 200 species in the genus distributed worldwide (so no help from plant distribution data, sadly). Following this argument I would not determine f6r as Drosera as it is in the list above (if the artist knew a Drosera so well, f6r as a different Drosera seems just not right). This species, if accepted, may be worthwile further linguistic studies because its medicinal properties were unknown to the ancient and first described in books of the Salerno school from the 12th century (Wikipedia). Thanks. It is useful to get such a well-informed identification. 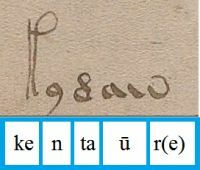 On f4r, identified above as either of two species of flax (genus Linum): the Voynich page starts with “katw–n”, and flax is “kattân” in Arabic and “keten” in Turkish. My suspicion is that the yellowish bulbous things descending from the leaf tips are meant to represent drops of honeydew, a thick, sweet, sticky liquid found on some plants or the ground below them. Honeydew is associated with a bunch of different species of shrubs and trees (particularly those associated with sweet juicy fruits), but the leaves and/or flowers are wrong for all of them except Crataegus. Despite the genus name, hawthorns don’t always have thorns (and some that do have them have rather inconspicuous ones). The leaves of some hawthorn species aren’t deeply lobed like the ones in the drawing, but some are, and that, plus geography, is how I picked the three species I did. 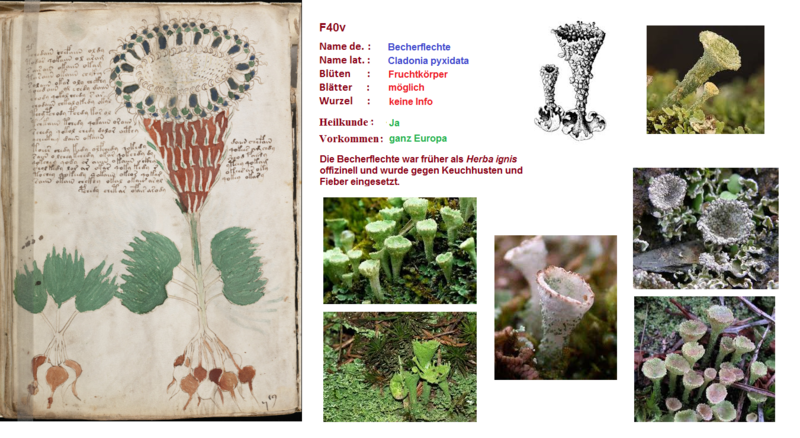 But it’s a big genus, so there could be others as good that I can’t name, and the plants the Voynich authors had in mind probably included multiple species. Something else about hawthorn leaves that isn’t easy to see in some hawthorn leaf pictures is that there are often substantial “stipules”: smaller leaves or leaf-like growths near the base of a fully grown leaf, which I believe are depicted in the drawing (and not most other Voynich plant drawings). 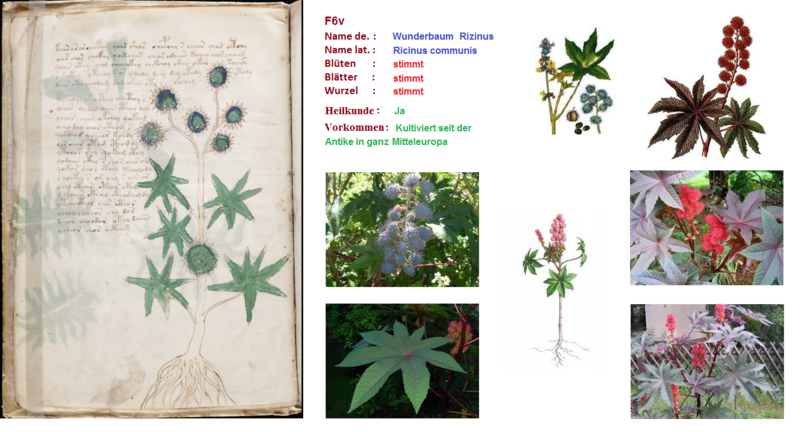 Finally, about the flower: The Voynich drawing’s flower doesn’t look much like most pictures of hawthorn flowers. But most pictures are taken of either flowers at the peak of floweriness or fruits at the peak of fruitiness, not transitional stages. 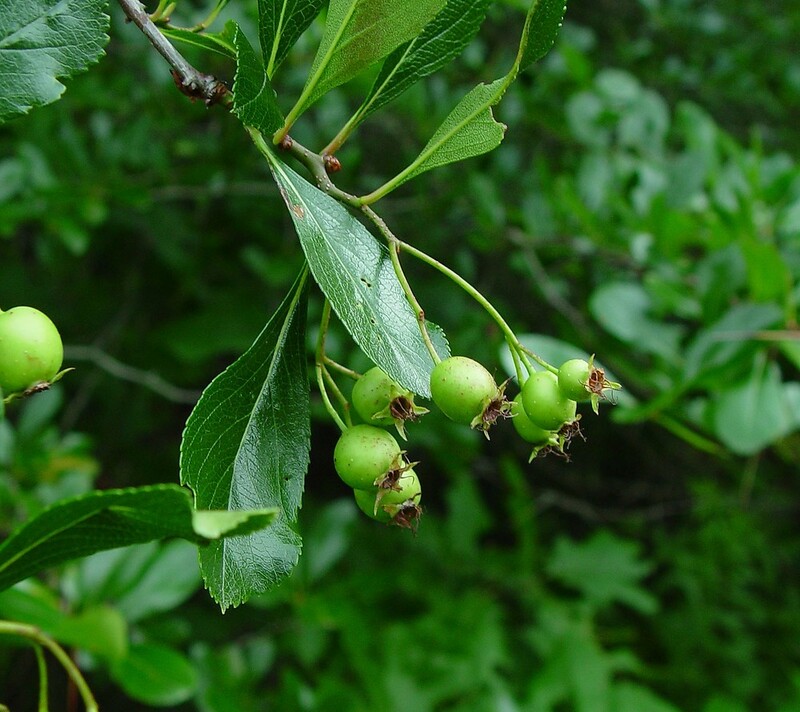 While the flower is transforming into a hawberry, the fruit starts at the flower’s base and grows out toward the end, leaving an opening at the end, through which some flower parts still protrude. As the berry gets bigger, the opening gets narrower. Since I posted that identification of plant f15r just from the picture, I’ve tried to find various languages’ words for “hawthorn”. Most languages, of course, gave me nothing I could connect to any of the page’s first few words. But I did find a few possibilities. “Hawthorn” is “khatmi” in Persian and Marathi, and “katili” in Urdu. Those languages are all Indo-European, like English and other Germanic languages where “hawthorn” shows up in forms such as “hegedorn”. The name is a compound word, coming from not one but two Proto-Indo-European roots: “khagh”, meaning “enclosure, boundary, edge” which gave English “hedge” as well as “haw”; and “trn” (in which the “r” would have acted as its own vowel), whose established derivatives mean “thorn” or “leaf” or “stalk”. 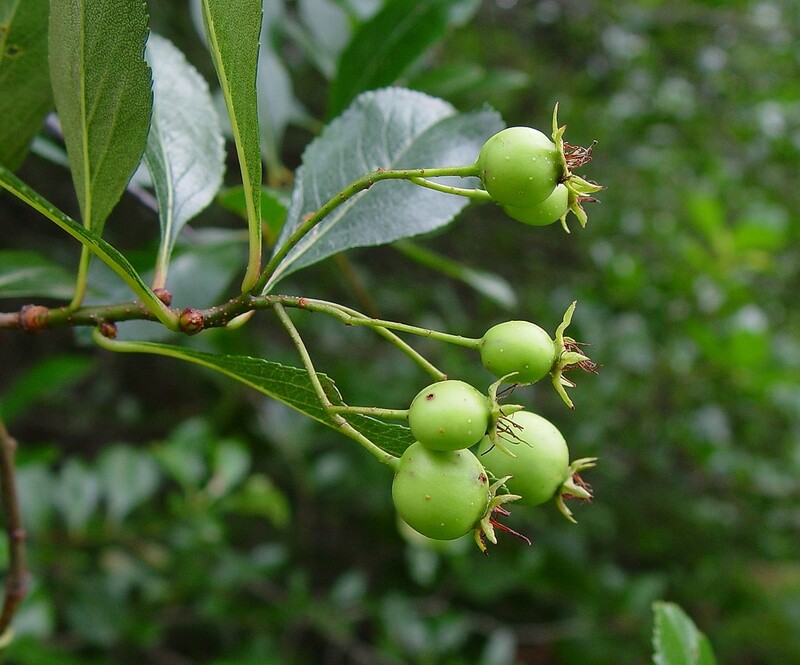 Whether or not the Indo-Europeans ever used “khaghtrn” for hawthorn plants, there’s a tendency for the final consonant(s) of the root word “khagh” to disappear from compound words in daughter languages, leaving the “haw/kha/ka” in “hawthorn”, “khatmi”, and “katili”. So that’s all there would be in a language where that “gh” bit had been lost and the second word wasn’t included, both of which there are known precedents for. And the Voynich page’s first word is “_xar”. “xar” is a common string of letters, either on its own or combined with more letters, but it doesn’t normally follow just this one letter (EVA-T), and no other page except f53v starts with anything close to such a word. All we need is for that first letter not to get in the way. It wouldn’t if it’s either a separate prefix, a silent symbol like a punctuation mark, or a sound that is compatible with a “kha” origin. It looks like our established “k” with another loop added in the upper left corner, so it could be an error where “k” was intended, or some kind of alternative version of “k”, or another letter with a similar sound. One option fitting the bill is “g”, which I’ve previously connected to this letter for unrelated reasons. Under another separate theory that it represents “L”, it would probably be a prefix here, since a “kha” root becoming “Lkha” doesn’t seem to be a likely development. An identification someone else made earlier for 15r was Carlina Vulgaris (carline thistle). I couldn’t look that name up because the source I’ve been using doesn’t include that genus. But I have found out that the common name, “thistle”, is translated as خار, “xar”, in Persian. The English word can refer to members of several genera, which makes it unclear exactly which kinds of plants its Persian translation might refer to because they might not always be the same ones. 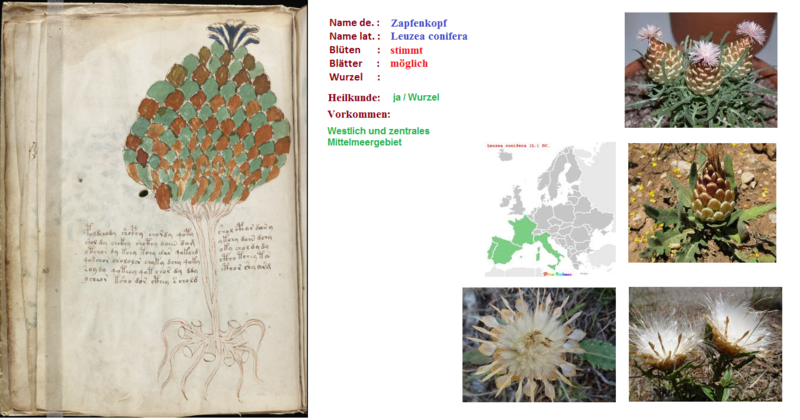 Several other Voynich plants have also been identified as different kinds of “thistles” in English, but this is the only one associated with a Voynich word similar to خار. 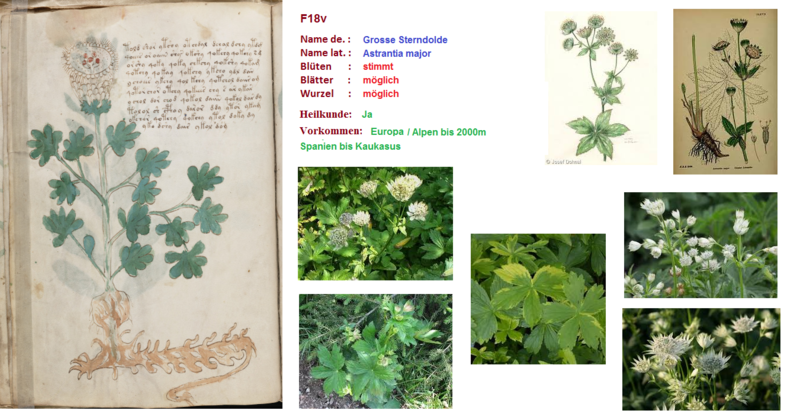 Just like for the same picture’s identification as a hawthorn, the name match is based mainly on the second and later letters of the Voynich word “_xar”, so it still leaves the same options open for the first one (EVA-T). So whether it’s really a hawthorn or a thistle makes no difference for the phonetic situation. One thing the thistle identification has going for it is the generally upright form with flowers on top and leaves along the sides of the stem. But I still think it’s a hawthorn because all of the stuff I said above describing it as a hawthorn doesn’t apply to thistles. Also, the base looks grafted, which is routine treatment for various small tree species but not thistles, and the plant on the other Voynich page starting with the same seven letters is clearly no thistle. I must retract the suggested cognates for f15r as hawthorn, because of lack of any source I know of where they can now be looked up and confirmed. Although I am still certain that “Hegedorn” is a cognate of “hawthorn” and that “hedge” is another cognate for the first part, those aren’t really useful themselves, and my original source giving the ones I reported earlier in Urdu, Marathi, and Persian seems to have vanished. In fact, a web search to try to find it now gives me this webpage, making it look like I made it up! Also, now that I use the voynichese.com search tool to see how common things are, I see that this folio’s first couple of words are too common to be this plant’s name anyway. If this plant’s name appears on this folio at all, it must be buried farther into the text. I do not see any implications from this for the rest of my list of names or the phonetic scheme they use. I am sticking with the plant identification as I explained above. I had no idea for the name then, so my assessment of the drawing from back then isn’t affected by anything new about the name now either. It just means this one goes back on the list of plants with plausible identifications but no recognizable names yet. Could there be any relation from “katili jhari” to http://en.wikipedia.org/wiki/Kata-vari_dialect ? f10v i qould propose that this could be one of galanthus maybe a gahanthus fosteri, there are even extintic versions of ths plant now days… due to over grassing. I think that Derek’s phonetics give something like “pahar abaratn” for the first two words of f9v (EVA:”fochor oporody”). For the following parallel, it is relevant that Derek reads EVA:ch as ‘h’ (sometimes correlating with ‘k’, if I remember correctly) rather than ‘y’ (as proposed by Stephen). The illustration has been often identified with members of the genus Viola. Indian names for “viola odorata” include baga-banosa, bagabanosa, bagabantsha (see Cinquefoil by C. F. Leyel, Indigenous Drugs Of India by Chopra R N, I.C. Chopra and Edible Medicinal and Non Medicinal Plants by T. K. Lim). I wonder if similar names exist for “viola tricolor”. I think the Sanskrit and Hindi names are closest, possibly this word (Banaphsha) is comprised of 2 elements (bana-phsha) which have been reversed. I don’t think these fit. They just call for too many individual sound changes, some of which are unprecedented. Please, note, that EVA:ch is a double letter. The first part of it is “c” with a long tail above, and the second part – a “c” without it. The first symbol can sounds like “h” and can provides the function of a soft sign. The second seems to be a vowel and carries sound “e” or “ee”. Also, the first part of EVA:sh (“c” with a long tail and a ‘ sign above) can be a hard sign. What words have you identified using either half without the other? 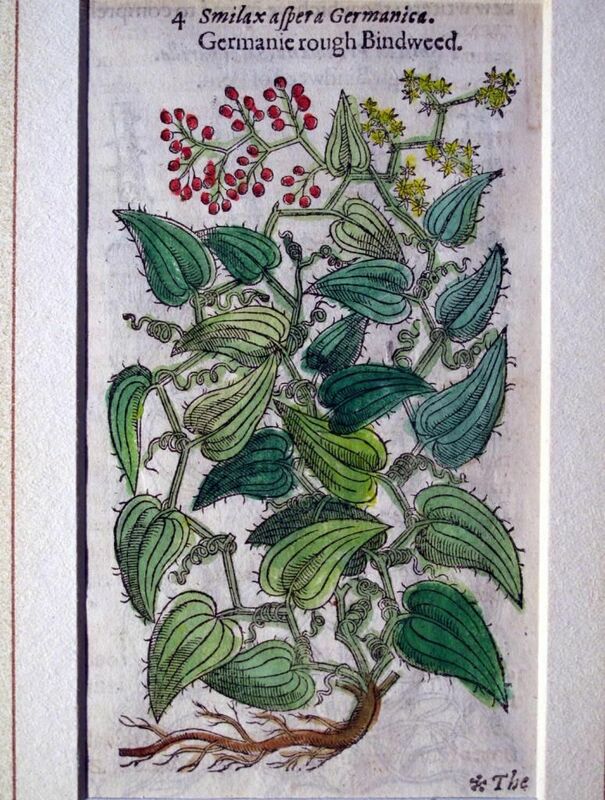 f9v (now I understand the folio edition) shows Viola tricolor – I believe that all depicted plants really exist (most or all of them in Europe) and that they were only strongly alienated and schematised. Ricinus, Centaurea, Malva, Paris, Mercurialis, Mandragora and others are good proposals. The author/painter wasn’t a botanist and he didn’t understand how plants “work”. His appreciation of plants was naive and clumsy: Many of the stalks and stems look as if they were sticked into the roots and rhizomes like in a vase (e.g. f16v, f93v). And most of the plants are depicted with opposite leaves (although most species have alternate leaves). And he didn’t understand the functionality of blossoms. All this seems to be not intentional in order to mask the species, but it matches with the zeitgeist and with lack of knowledge for biology. The roots sometimes look like (symbols of) human organs; maybe it concerns doctrine of signatures. That fits with the status of many plants as officinal plants and the magic thought; in Middle Ages botany only was part of medicine. I don’t know whether identification of a certain number of the plants and an assignment to words of the same pages in the VM can decrypt the text, but I propose to keep the principle of parsimony in mind. For me the VM is a herbal book combined with astrology, gynaecology (and fertility cult / fountain of youth, cf. Lucas Cranach’s painting of the “Jungbrunnen”), medieval mysticism and superstition – boringly normal subjects of Middle Ages. No great conspiracy of aliens from space, secret society etc. And I believe that the whole VM is of European origin (at most influenced by oriental medical science). Maybe the language is not or not allone European, but the type face is based on a contemporary European minuscule script (German, English, Italian …; late medieval). Suitable for the typical European style of all of the illustrations. Hello Jürgen, you wrote that “the roots sometimes look like (symbols of) human organs”. I would be curious to know more of this idea: of course, the subject is interesting because several researchers think that human organs might be represented by the “tubes” in the so-called balneological section. I’m not in the picture how the VM pagination works (“f9v” etc. 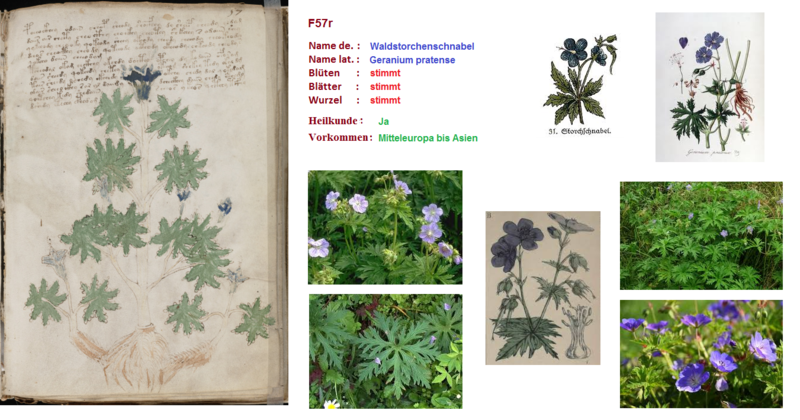 ), but if you (Renato) mean the plant of p. 20 (of 209 p. in the VM pdf one can download from the internet), it looks more like Viola tricolor, because this species (however, closely related to Viola arvensis) frequently has (dark) blue to lilac blossoms; arvensis usually has very pale yellow blossoms (like parts of two of the five blossoms in the VM, on the right margin). Viola tricolor is an officinal plant, too. Compare the pic in VM with the ancient illustration of Viola tricolor in Wikipedia: The figures look like “twins” – please note the zygomorphic corolla, the dimorphic leaves and the small roots. In my opinion, this is the VM plant with the strictest conformity to a real plant. Maybe its VM name can act as a reference? Here’s another suggestion, this time for f49v: Cyclamen. To identify this plant, I was especially prompted by the root tuber. Its shape and the marks on the tuber (either remains of roots or bulbous irregularities) reminded me a lot of this botanical print by Munting. Several species of Cyclamen have round leaves with lighter markings. Sometimes the white markings are so extensive, that the leave appears to be white with green markings. I think that the Voynich artist tried to put that into the picture. Cyclamen flowers are peculiar, with petals bent backwards. Either the Voynich artist didn’t manage to draw that, or perhaps thought it wasn’t important. Cyclamen is an old medicinal plant. This site cites form Dioscorides. I see f49r doesn’t have a proposed identification yet. I feel pretty confident about my identification: Dodder (Cuscuta), possibly Cuscuta reflexa although other Cuscuta species would be possible also. It’s a parasitic plant that attaches itself to a host plant and taps its saps, so that it seems to be part of the host plant. The green parts of the picture would then depict the host plant. The snake that winds itself through the roots would also be a reference to this parasitism. Cuscuta reflexa has medicinal uses, especially in Indian traditional medicine. Thanks – I will soon make a separate page and put your suggestion on it. Interesting – thanks. I’ll set up a page for it and ask the Finnish biologist his opinion. Can anyone make out the different Latin names for it in the illustrations? Lots of minims! I can see ‘smilax’ but what are the alternatives? Thank you Stephen, I am looking forward to read the Finnish biologist’s opinion! “Smilax aut smilas” at the very beginnig. I am not sure that the above is correct. Thank you very much for the update, Stephen! i’ve also looked and had reached the same conclusion as marc, also because this plant had been used in local medecine for a long period of time, so is somehow a more natural choice. Thank you for your comment, Renato. I found that Smilax apparently was also know as “vitis nigra” (“black vine”) or “bryonia nigra”. This is rather surprising, since I can see nothing black in this plant. Actually I am not sure this is exactly the same plant as Smilax, but if it isn’t it is another good candidate for f17v. 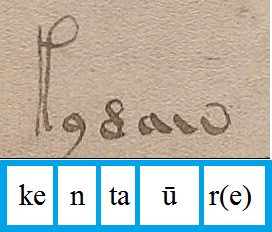 It would be tempting to assume that the first two words of f17v (EVA pchodol chor) mean something like “vitis nigra”, and that “chor” means “black”, similarly to what Stephen suggests for EVA “shor” in f29v. But since “chor” has 220 occurences in the manuscript, I am afraid it’s too frequent to mean “black”. f33v is a Fabaceae, because it has bacteria tubers on the roots. Perhaps Lupinus? The flowers are drawn so that they sit on the sides of the bellows, instead of sitting on the tip of the bellows. I wonder if the plant on the page numbered 21 might be Euphorbia supine, known as prostate spurge. 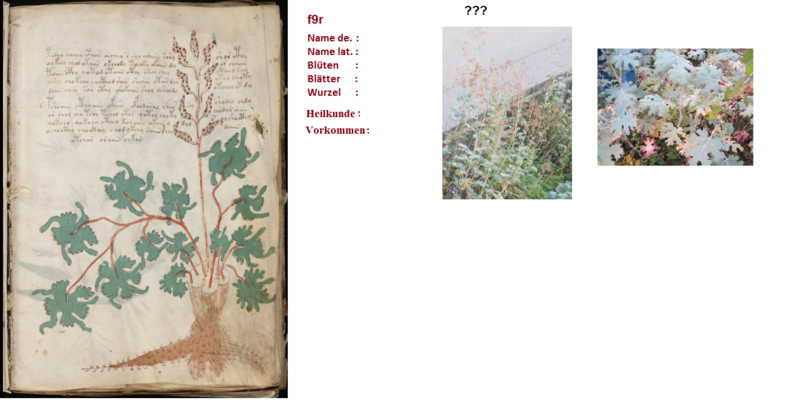 Here’s a link to a photo of the plant next to the illustration from the manuscript. Thanks Caroline. It certainly looks like it (f21r). I’ll make up a page with that plant soon and put your suggestion there as well. It looks almost too good to be true. What troubles me, though, is that euphorbia supine is a North American plant. I could find no indication on the web that it has a close relative in the old world. But the other proposals by your Finnish source also look good. I also thought of portulaca oleracea when I saw this plant. It sometimes shows up in medieval cookbooks as “purslane”. I think it is not Portulaca and also not a prostrate Euphorbia / Chamaesyce (with the problem of being native to America, in Europe only neophyte). Polygonum arenastrum fits better; a very common weed in (Central) Europe and an officinal plant. Links from this table to pages with detailed plant description would be helpful. Yes indeed – or else they are drawn from partial specimens perhaps?